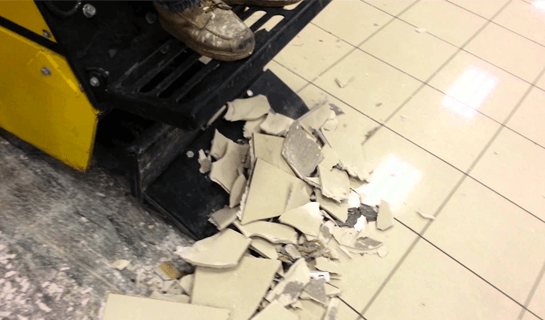 Floor Restoration & Demolition - Liquid Stone Inc.
LSI provides concrete floor demolition and restoration services for office buildings, malls, commercial or health care facility as well as residential high-rise buildings. Our team has managed and executed projects from a few thousand square feet to some of the largest malls in Canada. Our service includes dust mitigation systems and our methods ensure high production quality solutions that meet and exceed our clients’ expectations. Scarification is useful for preparing problem areas on concrete slabs: over-troweled burned areas, high spots, curled expansion joints, excessive trowel marks, and weather damage, uneven slabs, burned areas from overtroweling, remove oil and contaminants, mill scale. Scarifying efficiently deals with transitioning uneven surfaces and trip hazards. Remove epoxy coatings, thermoplastic coatings, paint and traffic lines, glues and adhesives while leveling uneven surfaces and trip hazards. This process can substantially lower the height of the floor by reducing concrete thickness by between 1/8″ and 2″ depending on requirements. Shot blasting is a cost effective and environmentally friendly method for preparing concrete and asphalt surfaces. This labour and time saving process strips, cleans and profiles simultaneously. Shot blasting leaves the surface immediately ready for the application of coatings or overlays, eliminating drying time and costly disposal procedures associated with other surface preparation methods. Shot blasting produces the highest bonding characterists of any surface preparation method. Concrete blasting works effectively on preparing commercial, warehouse, factory, retail mall floors and more. Remove dirt, oil and old markings or clean your concrete surface for overlays and markings. Prepares, cleans and abrades existing coatings for recoat and aids in obtaining a smooth aggregate floors. Removes coatings from a concrete floor. With experienced staff and technicians, you can count on great workmanship.